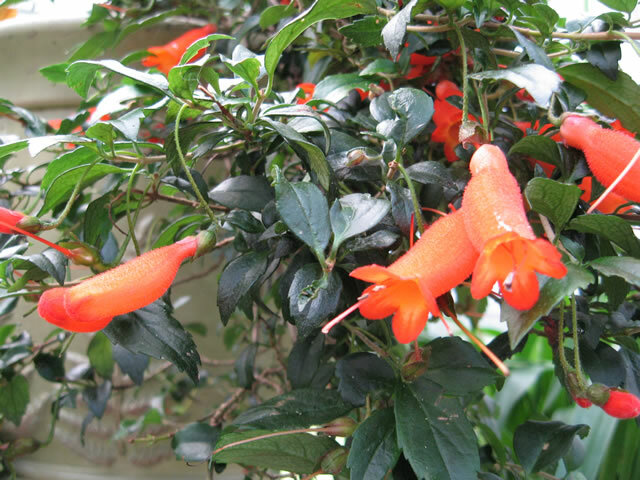 The Chilean Mitre Flower is a gorgeous creeping and climbing, loosely branching, evergreen sub-shrub from the cool rainforests of Chile. Mitre Flower plants have glossy, dark green, 1"-1½" toothed leaves arranged in pairs along woody stems that can easily reach 6 feet. tubular 1½" flowers with a soft, velvety texture. The flowers are followed by glossy red, ½" berry-like fruit. 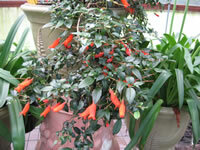 or just have them cascade down from a hanging basket. Chilean Mitre Flowers make excellent house plants, provided that they receive bright, indirect light and are grown in a cool (65°-70°) room. They should should be planted in a quality potting mix that has a high peat moss content with perlite added for drainage. Mitre Flowers resent transplanting, but when it becomes necessary, water the plant thoroughly before starting, and take care not to disturb the roots any more than is absolutely necessary. however plants don't like chlorine or fluoride, so it's a very good idea to allow the water to sit in an open container (un-capped milk bottle) for at least 24 hours prior to using it on your house plants. This also allows the water to warm up to room temperature. that has been formulated specifically for flowering house plants. Always follow label directions! Remove spent flowers and dead foliage regularly. Prune as needed to keep the plant tidy. Watch out for spider mites and whiteflies. Chilean Mitre Flower plants are only hardy in USDA zones 9-11. They are happiest where temperatures remain below 85°, with cooler nights. Ideally, they should be grown where they will receive sun in the morning and partial shade during the heat of the afternoon. Plant them in evenly moist, slightly acidic but well-drained soil that has been enriched with a generous amount of well decayed compost at planting time. Feed every two months when actively growing, with a Rhododendron type fertilizer. Always follow label directions! Take precautions to protect your Mitre Flower from slugs and snails. Watch out for spider mites, ants and whiteflies. Mitre Flowers are easily propagated with 6"-8" tip cuttings taken in early summer and struck in a moist mixture of peat moss and perlite. Another easy way of propagating new Mitre Flower plants is by simple layering. Using a piece of stiff wire bent into a U, pin a stem to the ground about 6"-12" from the tip. Cover the pinned area with moist soil. Once the layering is well rooted it can be severed from the parent and replanted elsewhere in the garden. Mitre Flower seeds have a very low germination rate of about 25%. Seeds should be sown directly in the garden in late fall, while they are still fresh.